The Nags Head in Reading is undoubtedly one of the South’s premier beer pubs. I remember coming here more than a decade ago when it was a very basic, dare I say rough Irish boozer. Its also the local of Twitters Sir Quinno who has just impressively visited every pub in Rutland on a long weekend. The pub is a five minute walk west from the town centre down the multi-cultural Oxford Road passing exotically named streets. And shop fronts displaying strange vegetables as well as some you may recognise. A handsome solid looking building, it is indeed a solid pub. It does what it says on the can, or chalk board if you prefer. All this choice maybe to much for some pub goers, but there is no problem with beer quality, it all moves at a rapid rate. Inevitably The Nags attracts many beer tickers, but is also very much a locals pub as well. It can be very busy when Reading FC are playing at home, its one of several official supporters pubs in town, but around 2 pm on a Saturday afternoon a double decker bus comes and takes them off to the Madejski and once again there is room to browse the beery pleasures. The pub has of course won many CAMRA awards over the years, and still does. 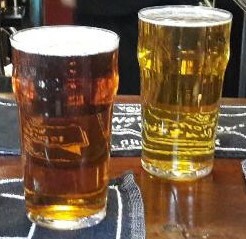 Many beer styles are covered at any one time, Milds, Pale/Golden, Stouts and Porters and occasionally even ordinary bitter, yuk. Interestingly seven of the twelve beers on yesterday were unfined. “Murk” alert ! They are badged as such and the staff make a point of warning customers of the fact unless they recognise you as a hardened beer drinking pubman. I tried a couple of murky beers and very nice they were too. Don’t drink with you’re eyes, is my advice, of course many do. Yes a top pub , luckily just a 40 minute bus ride away from me. I’ve been visiting Reading for work for many years but have never explored the pubs. This one looks great Citra – probably one I should make an effort to get to before I retire and the work trips stop!